Japanese Encephalitis | Christoph Gelsdorf, M.D. Should you get the vaccine? Vaccination questions are one of the most common inquiries I get from newly arrived expatriates. At the same time, finding ways to extend vaccination coverage to the majority of Myanmar citizens is one of the biggest challenges facing the health system. Japanese encephalitis (JE), a disease that is preventable by vaccine, is an example of how the decision to vaccinate on a personal or population-wide basis is not always straightforward. 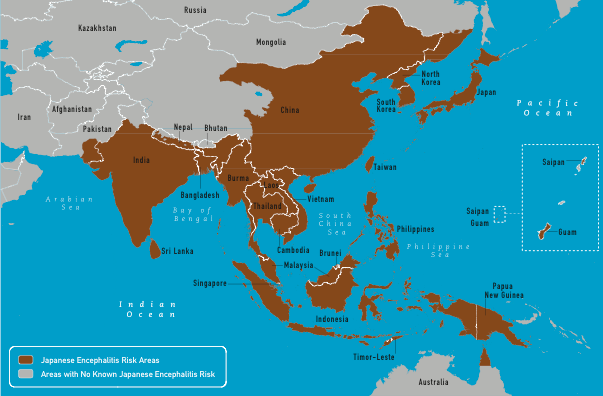 Japanese encephalitis is caused by a virus transmitted to humans by the Culex tritaeniorhyncus mosquito. Culex breeds in water pools and flooded rice fields and picks up the virus from pigs and water birds. Both mosquito and virus are present in most Asian countries whether temperate, subtropical or tropical. In climates such as ours in Myanmar, virus transmission tends to increase in the rainy and winter seasons but is possible year round. There are an estimated 68,000 cases of JE disease per year, most of which occur in children under 15 years old. Unfortunately up to 30 percent of JE cases are fatal while another 30pc result in lifetime neurologic disability such as paralysis, deafness and mental retardation. While the consequences of Japanese encephalitis are severe, when the virus infects humans it only rarely causes actual JE disease. In fact less than 1pc of infected individuals become sick. When disease does occur the initial symptoms arrive about a week after infection and include fever, chills, headache, muscle pain and fatigue, all of which occur in many other types of viral sickness such as dengue, malaria and the regular seasonal flu. Most patients simply recover, while just a few progress to severe encephalitis (inflammation of the brain) and its dangerous consequences. This late in the disease, treatment options are very limited. Diagnosing JE early is important in order to hospitalise patients and attempt to derail progression of the disease. In the developed world we use a lab test that looks for antibodies in the blood and cerebrospinal fluid. However, according to the laboratory in the private hospital in Yangon where I work, in Myanmar lab testing must be sent to Bangkok with a result taking up to 20 days – far too long to be useful in treatment decisions. So doctors, public health officials and patients are faced with a disease that rarely occurs despite being a common infection, is difficult to diagnose once symptoms begin (especially in Myanmar) and is usually devastating when it occurs. Also, we have a vaccine that can prevent it. How do we decide who should get it? We know that Japanese encephalitis is endemic in Myanmar and that it occurs mostly in rural areas, although peri-urban cases have been recorded. The United States Centers for Disease Control (CDC) notes that outbreaks have occurred in Shan State and older World Health Organization (WHO) data that I found shows cases in Karen State, Rakhine State and Bago and Yangon divisions. Japanese encephalitis is currently not part of the Ministry of Health vaccination schedule for Myanmar children. This is likely because of a lack of information on exactly where JE most often occurs as well as financial constraints, both of which make designing a vaccination strategy difficult. With the near eradication of polio, JE is the leading cause of childhood viral neurological infection and disability in Asia. As a result, Thailand has adopted universal childhood vaccination and seen a drop in JE cases. Different vaccines are available in different countries and are administered once or twice depending on the formulation. I recommend calling your clinic to ask if a vaccine is available and then making an appointment with your doctor to further explore these issues. Currently it costs approximately US$30 per dose at my clinic in Yangon. Choosing vaccination for you and your family ultimately depends on your socioeconomic access to health care services and the degree of Japanese encephalitis exposure created by your lifestyle.